Fashion Maven... Mommy: Cobalt Craze! There's just something about this color that makes me happy! Cobalt is one of the hottest colors this season and I'm here to show you how you can wear it! Yes, it may seem flashy to some but if you do it correctly, you can rest assured that you too can wear this pretty little trend without feeling as though it's wearing you! From bold to subdued, there are a million ways to wear blue! Check out my little cheat sheet for ideas on how to incorporate this pretty hue. Stila Stay All Day Liquid Eye Liner in Cobalt - I've been using this pen for almost a year now and i still adore it just as much as i did the day i purchased it! You can see my full tutorial on how to layer eye liners using this baby right here! Stila Smudge Stick Water Proof Eye Liner in Peacock is absolute perfection. I love that it's waterproof making it perfect for those summer scorchers! Pixi Endless Silky Eye Pens - I own several colors of these beauties. I simply adore how they glide on my eyes so beautifully. They stay put and the color pay off is spectacular! My current favorite colors are Black Blue, Black Tulip, Emerald Gold and Copper Glow! You can conveniently pick these beauties up at your local Target! Pixi Mesmerizing Mineral Palette in Emerald Gold - This is quite possibly one of my favorite Pixi palettes! I fell instantly smitten with this beauty at Pixi's spring launch. The second i laid eyes on the gorgeous jewel tones i knew it had to be mine! The emerald and mint are my favorite shadows of the bunch but they're all completely wearable and complimentary. At $12, i think this baby is a steal! 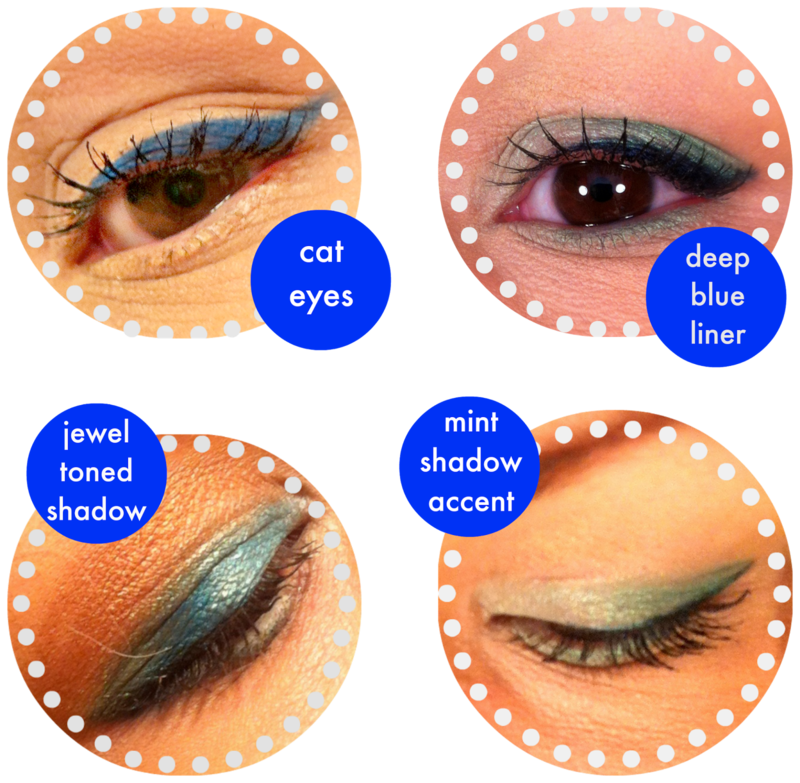 These are some of my favorite ways to wear blue on my eyes. What are some of your go-to blue looks? *Some of the products here are editorial samples. Some were purchased by me. All opinions are my own. Those blues look fantastic on you! You are such a whiz at makeup Carla.....count me in as JEALOUS!! !